We’re shutting up shop everyone. It looks like we’ve been pipped to the post. We’re out of the job. A recent post from UWA Memes for Reid Library Teens has provided all the analysis this election needs. A recent poll concluded that Kate Fletcher will be winning this election with 66% of the vote – it’s undisputed. It seems we didn’t go to online voting; online voting has come to us. Nothing says democracy like a Facebook poll from a meme page. Ignore the fact that both parties did a huge call out internally to vote on this dumb poll. Ignore the fact that new page Newspoll UWA has also put together an online poll to see people’s thoughts. Why bother with nuance when random commenter #28 tells us “the one in the red is better looking so I clicked on that”. So, we thought to ourselves, let’s take it a step further and look at the real social numbers on each candidate. We combed through every Office Bearer Profile Picture from all four parties and collated them into cold hard data. The proof seems to be in the pudding. 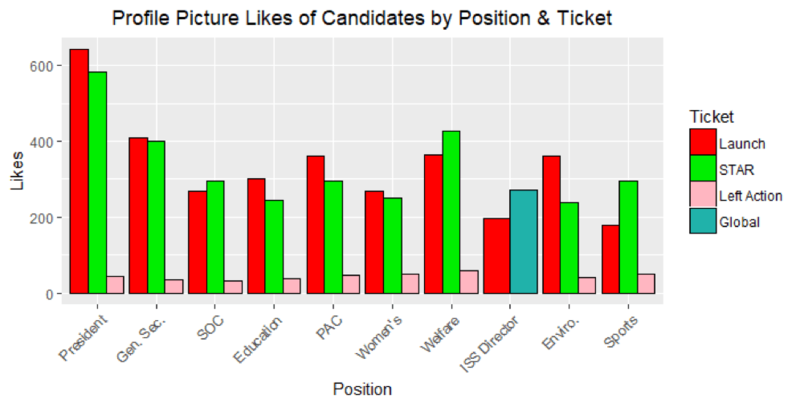 There are a million caveats to this data (including non-UWA students liking it and bi-partisan liking at the very least), and I would highly encourage no-one to decide their vote on the number of likes a profile picture gets. Yet cold hard data cannot be ignored. “Do likes actually translate to votes? What percentage of these likes were from UWA students, who can actually vote? What percentage of these likes had also liked equivalent OB profile pictures from multiple tickets? What percentage of these likes were from candidates/hacks vs “normal students” who could make up swing voters? At this stage it’s nothing to go off, but who knows! If, like Nate Silver, we manage to predict all these outcomes on an arbitrary model, we will definitely take it all the way to the bank.